Do you want to learn how to deliver a speech like a pro? Or gain leadership skills to advance in your career? Your goals are important, and Toastmasters’ proven program can help you reach them. By joining a club, you’ll gain the skills to become a more confident public speaker and a stronger leader in every area of your life. Members pay international dues of US $45 every six months. (Some clubs may charge additional fees.) All new members also pay a one-time US $20 fee. With more than 15,900 clubs in 142 countries, finding a club near you should be easy. It’s important to choose a club that fits your goals, preferences and schedule. You can also visit several clubs before you join one. If you can’t find a club near you, it’s easy to start one. Ready to get started? Toastmasters offers a proven education program that is divided into two tracks: Communication and Leadership. The program allows you to choose one track or both, and each features a series of projects that can be completed at your own pace. You also have the flexibility to work through each track separately or both at the same time, and you can repeat a track as often as you wish. Once you become a member, you can get started right away. 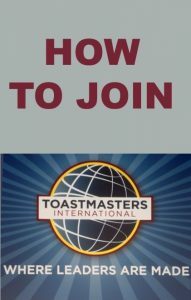 Every day, thousands of people go to Toastmasters meetings held within communities and organizations around the world. A club meeting isn’t set up like classroom. Instead, it’s a supportive group environment where people with diverse skill sets and backgrounds come together to practice their skills and exchange valuable feedback. How long are club meetings? Is there a fee to attend a club meeting? Clubs meetings are held in a variety of locations, ranging from corporations to colleges to restaurants to local community centers. Toastmasters’ global network is made of 15,900 clubs in 142 countries. Click here to find a club near you. As long as you are at least 18 years of age, you can join Toastmasters. There are no fees to attend a meeting as a guest. Yes. We encourage you to visit multiple clubs to find the one that best fits your needs. We recommend you contact a club prior to a meeting to confirm any time changes and meeting details.